I recently discovered a great (and seasonal!) 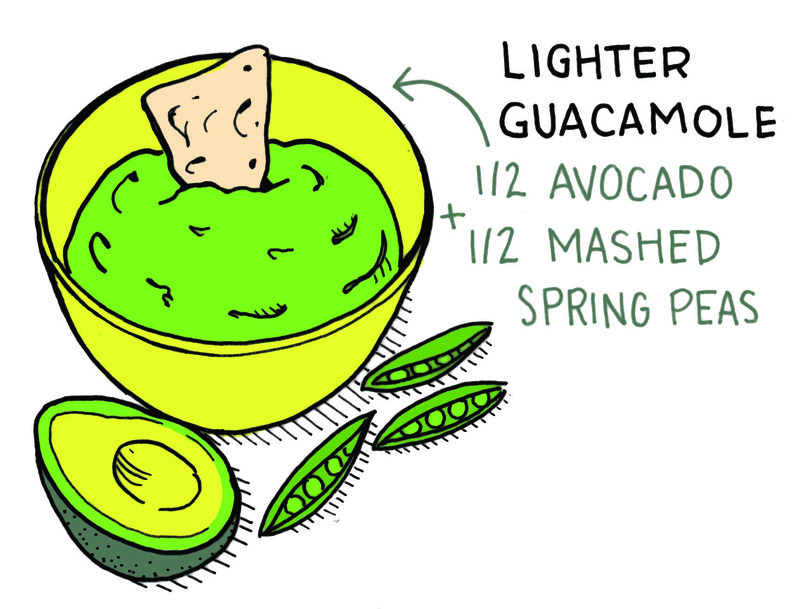 way to lighten up your favorite guacamole recipe. Just substitute half of the avocado for mashed spring peas. 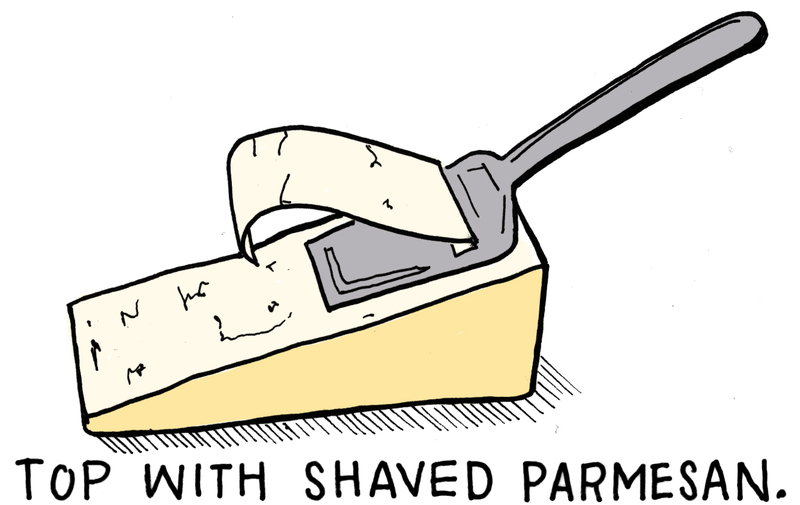 It make a nice springy appetizer, that isn’t as likely to ruin your appetite. 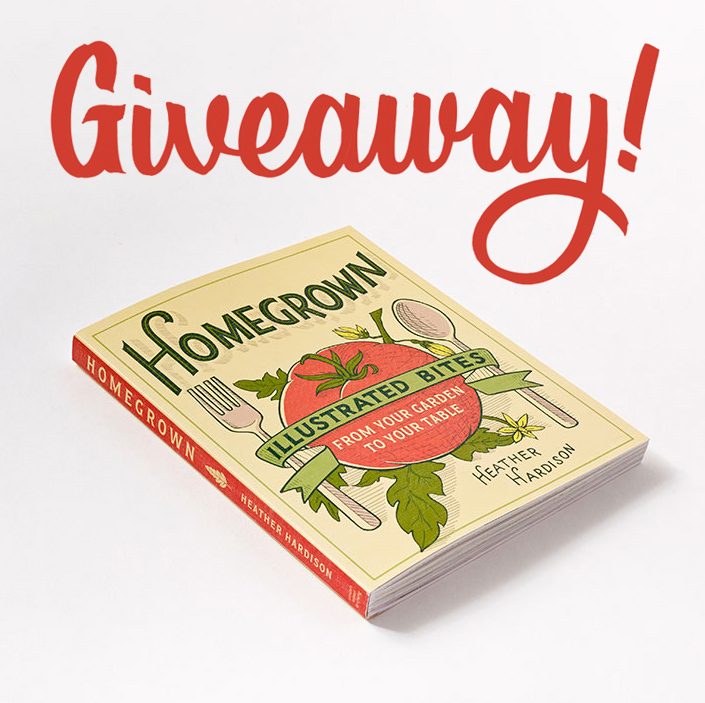 Homegrown has finally been released, and I couldn’t be more excited! I was such a long time in the making that it feels amazing that it’s finally a real thing out in the world. Oh, and people have been saying some really nice things. To celebrate, I wanted to share an excerpt with you, and do a giveaway of the book! 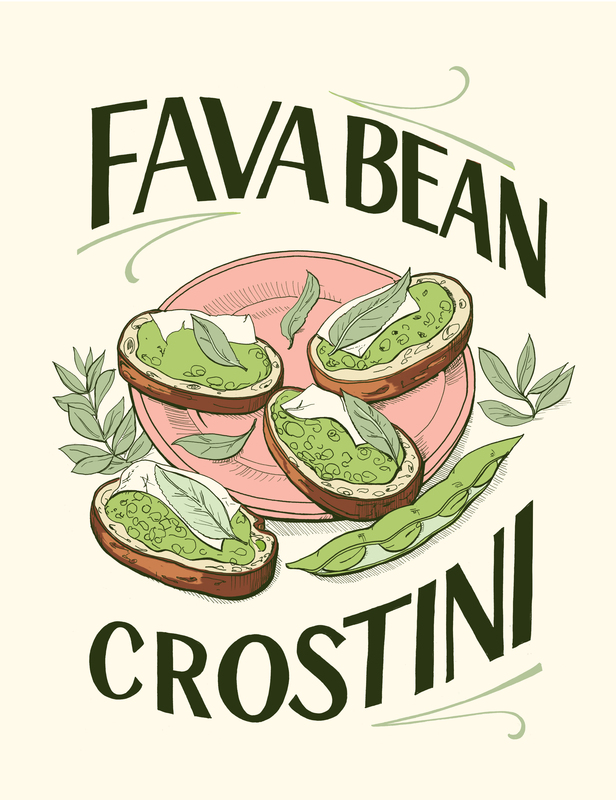 This Fava Bean Crostini recipe is from the Spring chapter of Homegrown. In the book, this recipe is accompanied with information of how to grow fava beans, and an illustrated how-to peel fava beans. I hope you enjoy it! Shelling fava beans certainly takes some effort, but their buttery texture and nutty flavor are worth the trouble. Once the fava beans are shelled, this appetizer comes together quickly and maximizes your efforts, literally spreading the reward around. The nuttiness of the fava beans is complemented by the clean, crisp flavors of the lemon juice and mint, and the crunch of the toast adds a great contrast to the soft spread. If you’re planning a dinner party, you can shell the beans the night before and the whole thing can be prepared in 15 minutes. You can substitute lima beans or edamame for the favas if you’d like. Preheat the oven to 400°F (205°C). Arrange the baguette slices in a single layer on a baking sheet and drizzle them with the 1 to 2 tablespoons oil. Slice the clove of garlic lengthwise and rub the cut side all over the top of the bread slices. Put it aside. Toast the bread in the oven for 9 to 10 minutes, until golden. Peel the fava beans from their outer shell. 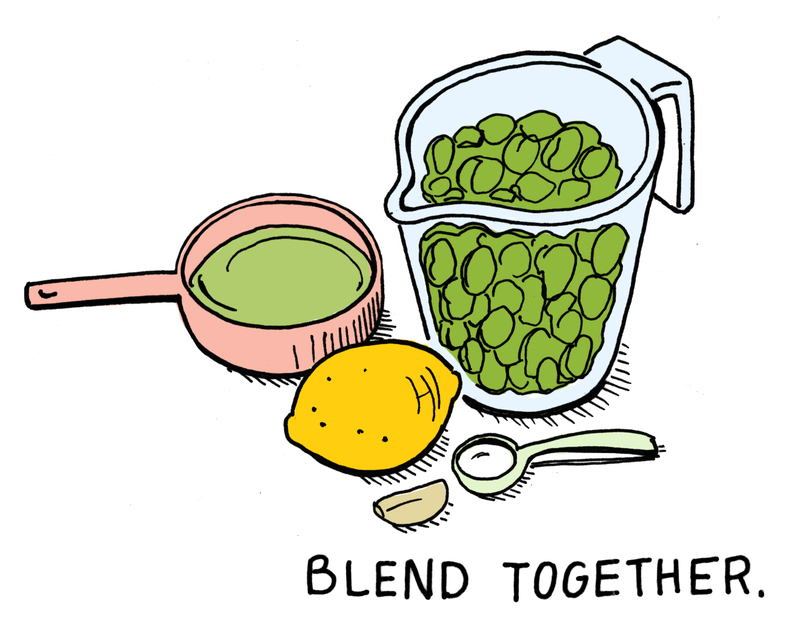 Put the fava beans, the remaining cup (60 ml) oil, the lemon juice, lemon zest, garlic, and salt in a food processor. Pulse until you have a mixture that is blended but still has a little texture (it shouldn’t be completely smooth like hummus). Put a healthy dollop of the fava mixture on each piece of toast. Top with some cheese and a mint leaf and serve. I want all of you know how appreciative I am of your support of this blog. I started Illustrated Bites came at a time in my life when I was struggling to get on my feet after school, and trying to figure out how to make it as an illustrator. Some of you reading this have been with me since the very beginning. All of you who pinned my images, shared the posts on Facebook, or elsewhere really helped to get me on my feet. The fact that I got a book deal was directly due to you helping me spread the word. Thank you so much, y’all are amazing. To say thanks, I would love to give one of you a copy of my book. To enter the giveaway, just leave a comment below. The giveaway will be open until May 1st. I’ll announce the winner on that Friday. If you would like a second chance to win a book for yourself and a friend, I’m also do a giveaway on Instagram. Just follow me there, and check out the instructions on the giveaway post. Hey y’all. It’s been awhile. After two years of working on my book based on this blog; I’m excited to announce the book is finished. 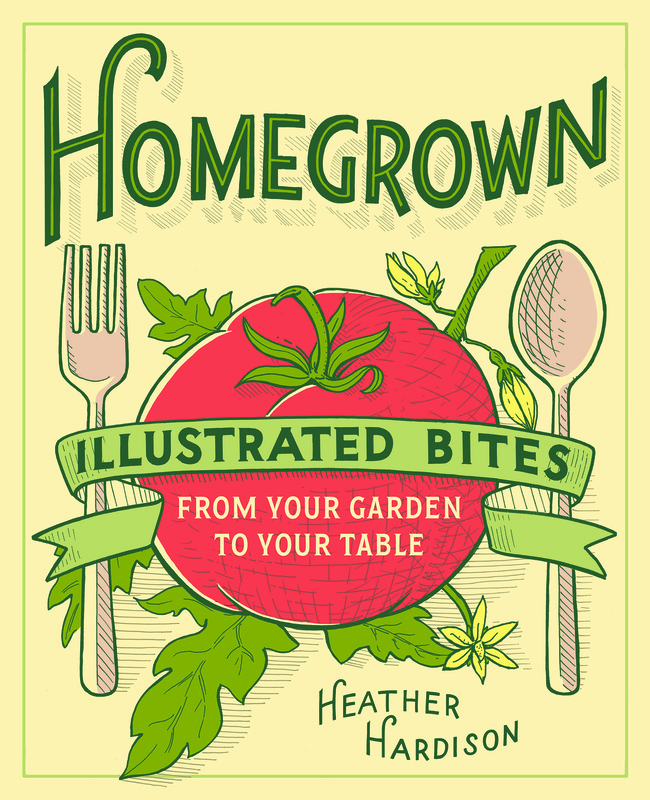 HOMEGROWN : Illustrated Bites from your Garden to your Table will be released mid-April! YAY! It was a long haul, but it’s finally done and I’m looking forward to sharing more soon. (You can check out some sneak peeks on my Instagram.) I’ve added an Illustrated Bites Book tab to the menu, so you can order yourself a copy. Tell your friends! The last year was definitely a difficult one, and when you’re super busy it’s really hard to eat right and make meals at home. 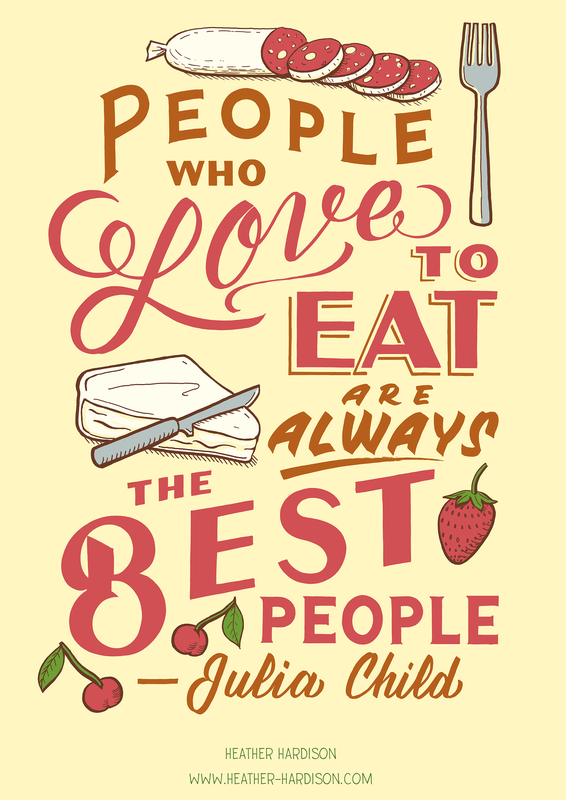 I found myself spending the whole day writing and drawing about cooking, but not actually doing it . When you eat out a lot, or just eat badly, it ends up dragging you down and making you sluggish. It’s hard to get stuff done with a pizza hangover. Mason jar salads SAVED ME. I’m sure you’ve seen these by now (they’re all over Pinterest.) They’re a great solution for eating right with a busy schedule. 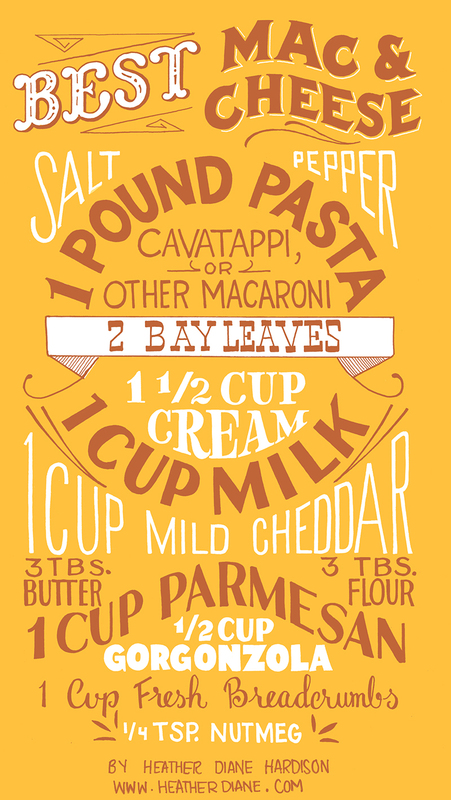 You can make a weeks’ worth of lunches on Sunday, and then it’s just grab and go during the week. I’m a hungry person, and not exactly a “salad girl”, but these are amazing. Just be sure to load the salad up with plenty of protein, whole grains, and nuts to keep you from getting hungry by mid afternoon. Thank you so much for sticking with me these last few months. I know I’ve been a bit of an absentee blogger (and by absentee, I mean I haven’t posted in two months. Whoops!) BUT I’ve got a big project that I’m working on, and I think you guys will be excited to hear about it! (Hint, it starts with B, and rhymes with look.) Can’t wait to tell you more! As always, I appreciate you visiting my blog. Take care everyone, and I’ll be sharing more soon.